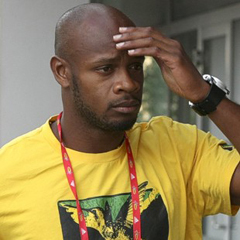 London - Former world record-holder Asafa Powell will miss Jamaica's Olympic 4x100m relay with a groin strain that has ruled him out for the rest of the season. The 29-year-old Powell sustained the injury during Sunday's 100m final, in which he limped in eighth and last position. "Confident that Team Jamaica will deliver a great 4x100 relay. Join me in cheering them on!" tweeted Powell. The Jamaican quartet are the ones to beat in the relay. Their world record-breaking victory at Beijing 2008 concluded a fabulous Games for their sprinters, and particularly Usain Bolt, who also won the 100m and 200m. They have continued to dominate since, winning the world title in Berlin 2009 and lowering their world record to 37.04 when winning at the 2011 world championships in Daegu, South Korea.